As you can no doubt guess, traveling with a toddler is vastly different than traveling as a couple. 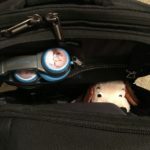 Gina has always been worried about bags being lost on flights, so as a general rule, we didn’t check bags, sometimes getting rather creative to live out of a carry-on for nearly two weeks. Now, between extra clothes, diapers, blankets, stuffed animals, and such—not to mention a stroller and (for this trip) car seat—checked bags are a necessity. We carried backpacks onto the flight (including Ollie’s tiny and adorable fox backpack), and gate checked the stroller and car seat. For the final leg, we even checked the car seat. No lost items, and vastly easier to get through the airport! Then there’s the matter of getting a toddler to sit still for a five-hour cross-country flight. 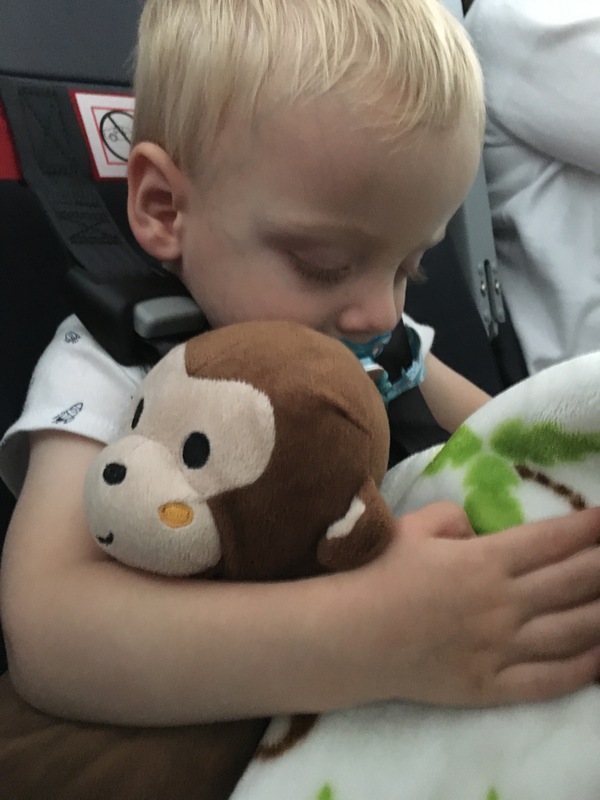 The stuffed animals and blanket we crammed into those carry-on backpacks come in handy, since it’s much easier for him to nap with them. Those in-flight naps are key. We interspersed the rest of the time with as much entertainment we could muster. 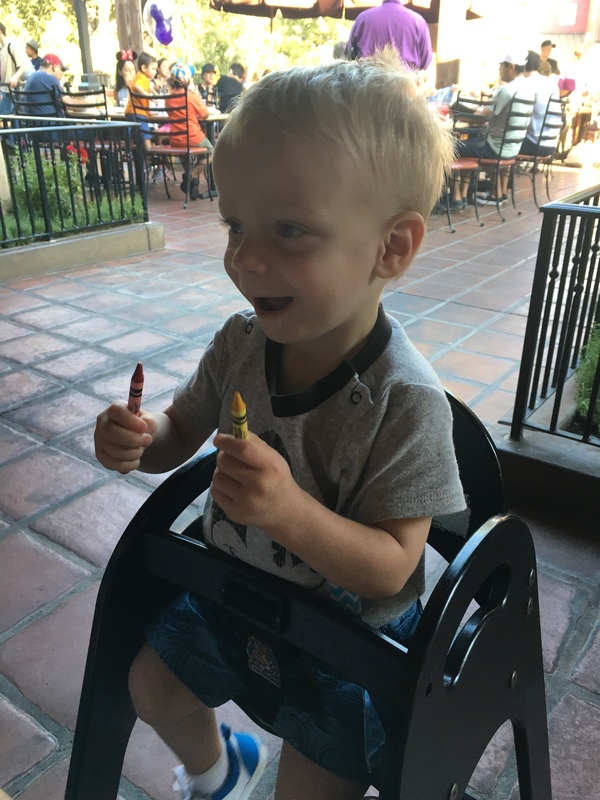 An iPad crammed with children’s books and episodes of Sesame Street (or “Elmo!” as Ollie likes to call anything Muppet-related), a portable magna-doodle, some Crayola Wonder, flash cards, toys… anything we could think of that might entertain him for a few minutes. Sure, he did his share of crying, but the preparation paid off overall. After a quick fast-food dinner stop en route from the airport, we checked into our hotel, right across the street from Disneyland. 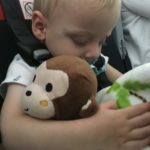 We’ve frequently had to wait for a crib to be delivered to our hotel room when traveling with Ollie, and this time was no different. The delivery was quick, however, and for a nice change, it was an actual (foldable, portable) crib instead of a Pack-n-Play. Despite “Mini Suites” being included in the hotel’s name, it’s just a code for “large-ish room,” and we were all in the same boat. Not a big deal (Ollie stayed up a little late, we went to bed a little early), though an actual suite can be far more relaxing! The next day, we headed into the park. We had taken Ollie to a local amusement park previously, which did not go all that well, so our expectations were set low. Far too low, as it turned out. 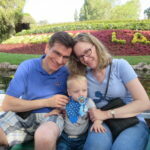 We started off with a quick trip on the Storybook Land Canal Boats. 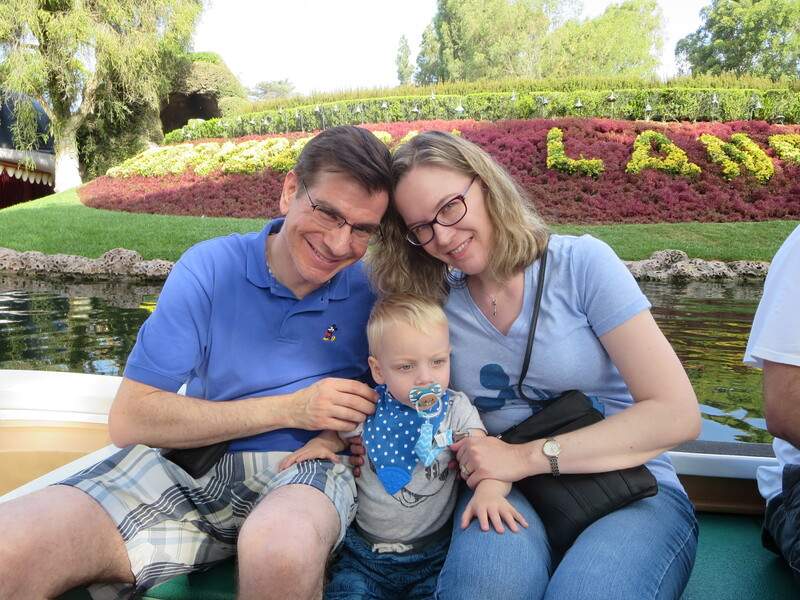 A boat ride was one of the few things he’d tolerated at the local amusement park, so we figured it was a safe bet. Ollie was… I don’t think “bored” is quite the correct term, but he seemed more excited for the banana we’d gotten him to eat while waiting in line. From there, we went to Small World, and the magic began. Small World has never been a ride I’ve gotten too excited about. Sure, it’s a must-do if I’m bringing someone into a Disney park for their first trip, and I’ll go on every few visits, but I’m not upset if I miss it. Seeing it through Ollie’s eyes, though, was nothing short of amazing. He gazed at all the figures in wonder, tapped out the tune on his little leg, sometimes pointed at something he particularly liked (he seemed to enjoy the animated sun), we’d point out things we knew he’d recognize (usually animals). When the ride was over, he immediately asked “more?” and we knew at that point it’d be a good trip. From Small World, we took the train (hooray for the return of Primeval World!) back to the front of the park to meet up with my cousin and family. 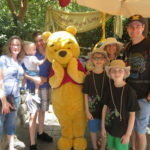 After rides on Pirates of the Caribbean (which he loved, already being familiar with the song) and Winnie the Pooh (also a hit, given familiarity with the characters), we got in line to meet some Hundred Acre Wood characters (in all my adult visits, this was the first character greeting I’d done). 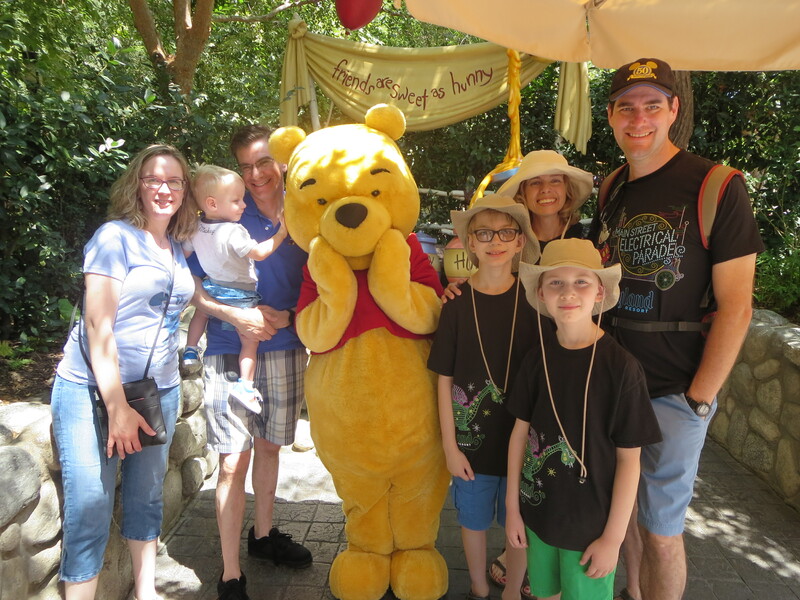 Since he was indeed familiar with the Pooh characters, Ollie was very excited to meet them. 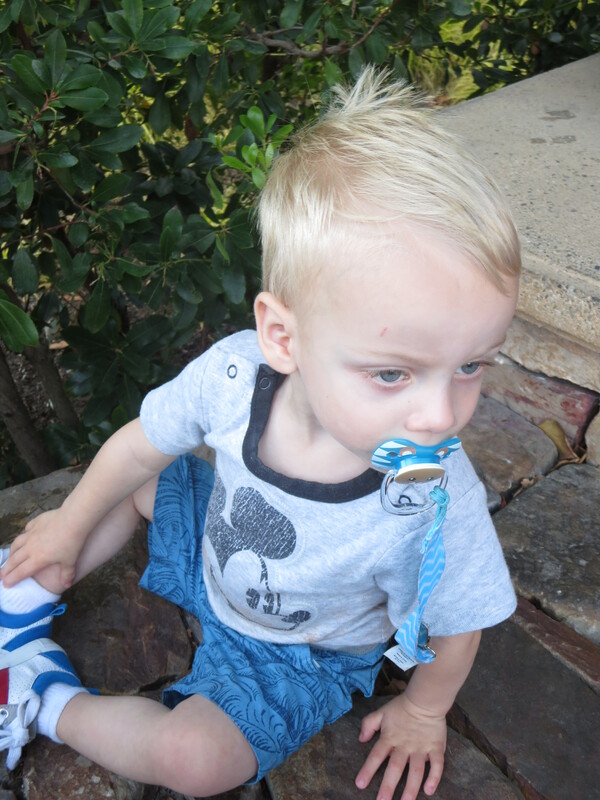 After a bit of a wait, we walked up to Tigger and Eeyore… and Ollie clung to my leg. I picked him up, but he wasn’t too crazy about going close to them. Next up was Rabbit. He got a bit closer, nearly touching Rabbit’s fur, but still no contact. Finally was the bear himself: Winnie the Pooh. It took some coaxing from a great cast member, but eventually, Ollie got brave enough to give Pooh a high-five, and was thrilled to do it. He’d recall this moment for the rest of the trip. From there, it was lunch at the nearby Hungry Bear. We ended up in the world’s sunniest and slowest-moving line; that and hunger led to some minor crankiness (mostly from me) by the time we sat down to eat. After lunch, Ollie was fighting both his stroller and his shoes, complete with attempted biting, so it was clearly time to head back to the room for a nap. We bid farewell to my cousin and family, and returned to the hotel. I hopped on the Disneyland app to make a dinner reservation while Ollie quickly fell asleep. Post-nap, we crossed over into California Adventure. 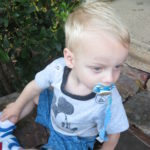 We took Ollie on Heimlich’s Chew Chew Train. That got a “meh” reaction overall, and we were for some reason forced to hold Ollie on our laps instead of having him sit between us, which he did not like at all. Thankfully, that “rule” wasn’t enforced on any other rides. He enjoyed the Little Mermaid ride, and we pretty much confirmed at that point that he preferred the dark rides. We then ran through the bakery tour for a slice of sourdough appetizer before dinner, then headed over to Wine Country Trattoria for our reservations. Despite a somewhat long line for check-in and a snafu with the reservation (they claimed I’d cancelled it, but I showed them the reservation on my phone app), we were seated fairly quickly, and had a reasonably relaxing meal. Okay, the wine country wine helped, as did Ollie occupying himself with the kid’s menu and crayons. Meals with a toddler are never that relaxing, but I’d say the vacation meals were not really any worse than most meals at home. We ran into the Pixar parade after dinner, and Ollie had a seat and watched for a bit on a nearby low wall. 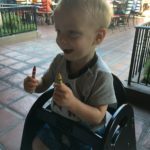 From there, it was a stop into Ghirardelli for dessert—ice cream cones for me and Gina and a chocolate-covered strawberry for Ollie. He ate off some of the chocolate and munched on a bit of the strawberry stem before dropping it on the ground. No fussing, and I think he enjoyed what little bit he got. And damn, those ice cream cones were delicious. Then, as if we hadn’t done enough already, we crossed back into Disneyland! But finally, it was time to say goodnight, despite Ollie’s pleas (“ride? ride?”) We headed back to the hotel for a good night’s rest, with the next day’s plans comprising nothing but dinner with my aunt, uncle, and another cousin and family.